In the last Research Made Simple Series article, we briefly outlined the main phenomenological research approaches in relation to investigating healthcare phenomena including Interpretative Phenomenological Analysis (IPA). IPA was originally developed as a method to undertake experiential research in psychology1 and has gained prominence across health and social sciences as a way to understand and interpret topics which are complex and emotionally laden, such as illness experiences.2 In this article, we detail in more depth, the philosophical and methodological nuances of IPA. The aim of IPA is to uncover what a lived experience means to the individual through a process of in depth reflective inquiry.3 IPA draws on phenomenological thinking, with the purpose to return ‘to the things themselves’ (p 168).4 However, IPA also acknowledges that we are each influenced by the worlds in which we live in and the experiences we encounter. Therefore, IPA is an interpretative process between the researcher and researched, influenced predominantly by Heidegger’s interpretive phenomenology, hermeneutics and idiography,2 3 summarised in table 1. 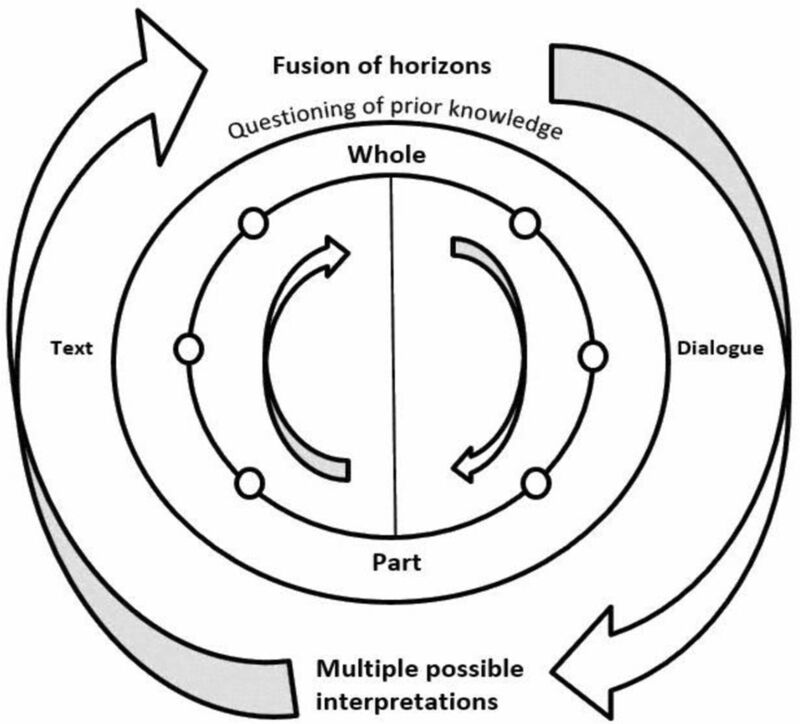 The hermeneutic circle congruent with Interpretative Phenomenological Analysis (IPA). How the researcher’s prior conceptions interact with new experiential encounters is of significance to IPA. Heidegger emphasised that rather than bracketing our prior conceptions prior to engaging with participants and the data, we should acknowledge how they consistently reveal themselves throughout the research process.3 Therefore, an IPA researcher needs to be mindful of their own beliefs, perceptions and experiences so that they can enrich their interpretations rather than them being an obstacle to making sense of the participant’s experiences. This is achieved through the art of reflexivity. In summary, IPA is a meticulously idiographic and hermeneutic phenomenological approach that seeks to illuminate the way individuals make sense of their lived experiences. Engaging in this method of qualitative enquiry can facilitate researchers to construct insightful interpretative accounts of experiences that can enrich understanding and bring to light prominent matters within healthcare.
. Interpretative phenomenological analysis: theory, method and research. London: Sage, 2009.
. Logical Investigations. Oxon: Routledge, 2001;1.